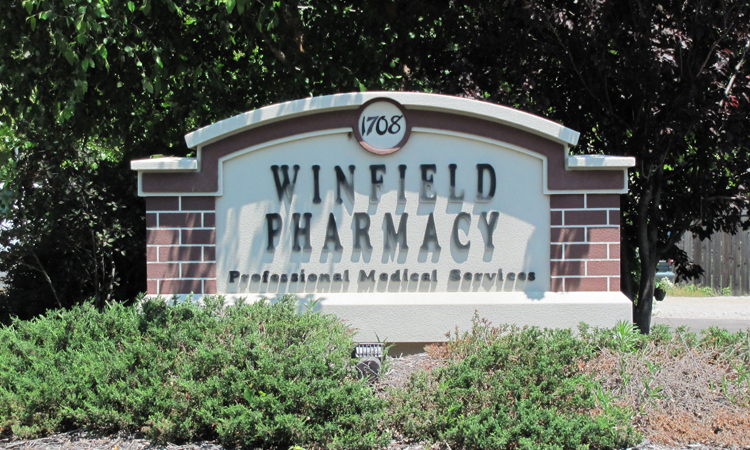 Winfield Pharmacy was started in 1978 by Gary and Jeanette Vratil when they purchased Bird Rexall Drug. In 1994 Gary and Kent Vratil opened a compounding pharmacy, Professional Medical Services, located in the same building as Winfield Pharmacy. Professional Medical Services also now fills prescriptions for nursing facilities. In 2003 we outgrew our previous facilities and moved to our current building at 1708 E. 9th where we continue our tradition of providing the best possible care for our friends and neighbors. In addition to the town of Winfield, Winfield Pharmacy and Professional Medical Services offers services for Cowley County, Arkansas City, Wellington, Oxford, Douglas and El Dorado. Winfield Pharmacy and Professional Medical Services owners and employees enjoy contributing their time and resources to these communities. We thank the community for all of their support! Winfield Pharmacy has been a Board of Certification/Accreditation (BOC) Facility since 2009 and has provided Durable Medical Equipment, including oxygen therapy, to patients for over 30 years. Winfield Pharmacy has Certified Therapeutic Shoe Fitters on staff. We received our Accreditation as a Medicare Supplier in 2011 from The Board for Orthotist/Prosthetist Certification. Do you have a loved one in an assisted living facility? Do you know that you have the right to choose your pharmacy for that loved one? Winfield Pharmacy would be glad to provide your loved ones medications. We stock a complete line of prescription medications, brand and generic, to meet the needs of our patients. We also offer a vast stock of OTC medications, cold remedies and wound care supplies. We deliver your prescriptions to your doorstep. Our normal delivery hours are Monday through Friday 1-6 and Saturday 10-12. Our compounding pharmacists create medications not met by commercially available products. We are qualified to provide Flu, Pneumonia or Shingles shots to anyone 18 or older. We help patients choose the right form for specific situations that are comfortable, fashionable. We provide prescriptions in blister packs for those patients who reside in a group home setting. We're here to answer questions you have about your medications or health conditions. Med sync is designed to allow you to pick up all of your maintenance medications on one, convenient day.